Engaging in the thoughtful question, “Is there anybody else out there?”, Curiosity, the rover, goes on a 350,000,000 mile journey into the universe to find some answers. This charming personified robot tells her unique story to an audience that is sure to be captivated. Using a wide variety of graphics and illustrations, author/artist Motum tackles many logistical complexities about space and space travel. Why travel to Mars? How would Mars space travel differ from missions to the moon? Why is finding water important? Why send a robot instead of a human? What are some unique considerations for exploration technologies? How do scientific ideas become realities? How is it that in looking for an answer to one question, dozens more arise? It takes one talented illustrator to tackle these topics, and Motum has hit the mark spot on. His clean, retro design sense works well with the space age themes. His color schemes blend the cool vastness of space with the rusty dust of Mars. Feelings of elusive mystery combine with the grounding capacity of scientific facts in the energy of his presentation. In addition to the excellent visuals, the storyline and narration could not be more appropriate. 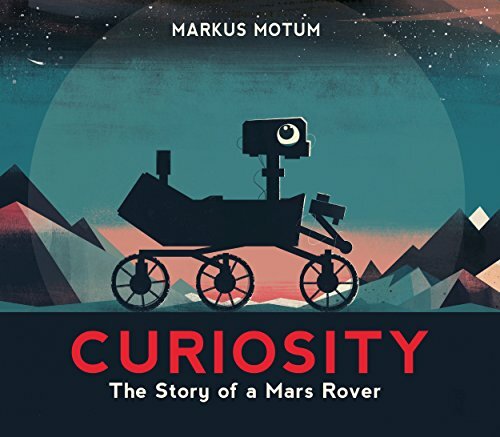 “Because NASA uses feminine pronouns when referring to ships of exploration and spacecraft . . .” Motum made the decision to keep the Curiosity rover in this story a female. This inclusive gesture will go lightyears beyond the STEM gender gap and help make girls comfortable using their intellectual gifts in this realm. It is also interesting to note that a young girl is given the credit for suggesting Curiosity as the rover’s name! With a wonderful voice Curiosity covers the gamut of her lifecycle. From her creation in the Jet Propulsion Lab near Los Angeles, CA, to the various gadgets integrated into her systems, to her launch and landing on Mars, to the tests she is conducting and the data she is still collecting, her story is a fascinating page turner. And it continues to this day with the possibility that her work might culminate in future generations of humans inhabiting Mars. One interesting addition is a time line of NASA Mars Missions, which began in 1964. Trials and errors, successes and failures, are all included, which considers the unavoidable reality of risk in such complex endeavors. Taking risks, expanding horizons, and achieving the seemingly impossible—all qualities necessary for answering that age old is-there-anyone-out-there question—makes this a book to get excited about.